We’re excited to announce the cast for Geoids Musical Theatre’s October production, Andrew Lloyd Webber’s Sunset Boulevard. While we already have a small army supporting this show, it’s not too late to get involved in a backstage or production role (set construction, props, costume, hair/makeup, marketing, front of house), no matter what your experience. For more information, email geoids.sunset@gmail.com. 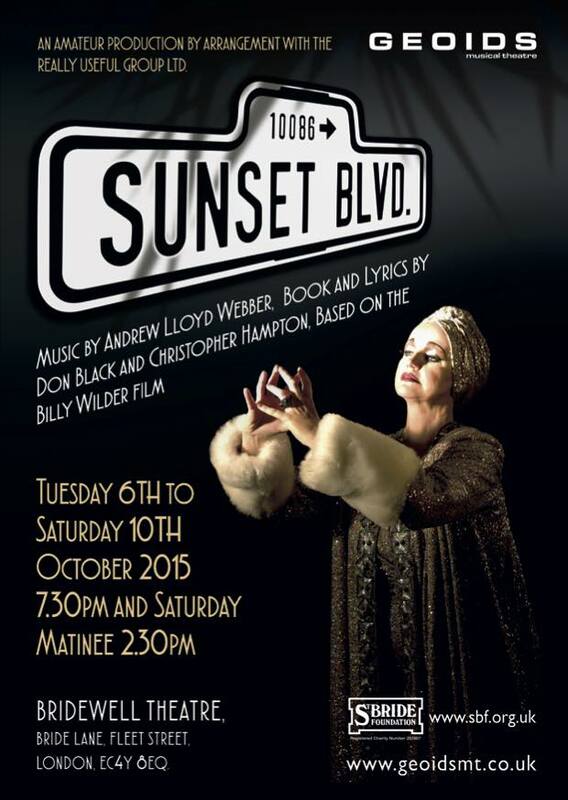 Sunset Boulevard will run each evening from Tuesday 6th to Saturday 10th October at the Bridewell Theatre, plus a Saturday matinee. With pre-production for Sunset Boulevard well under way, the committee are already looking ahead to 2016. We’re kicking off the selection process for next year’s shows and have a pitch document available on request. If you want to be a part of a creative team for 2016, get in touch. Our plan is to produce two full musicals and one cabaret/concert during 2016. We’ve pencilled in one full show for late May and we’re looking to stage the second between late October and early December. The deadline for proposals is Monday 27 July so don’t delay! Request a proposal document today by emailing geoidsmusicaltheatre@gmail.com. Celebrate an early American Independence Day and the arrival of some sunshine with a few drinks near Waterloo. We’ve got a room to ourselves so there’ll be plenty of space to catch up with friends and also an opportunity to find out more about upcoming productions and how you can involved. Join us from 6:30pm at The Mulberry Bush, 89 Upper Ground, London, SE1 9PP.